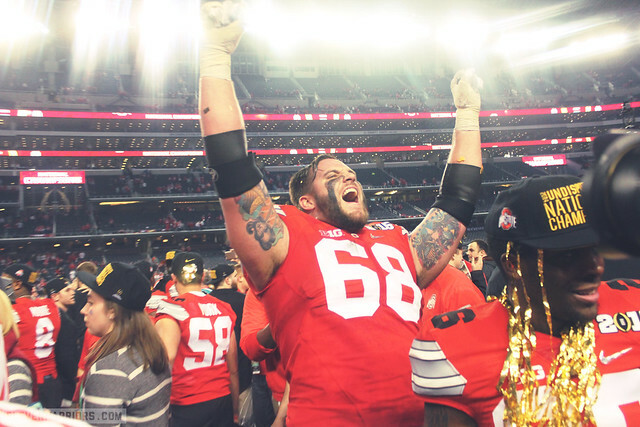 In season that watched Ohio State rally past season-ending injuries, a humiliating loss in early September, and a tragedy, here are the top 10 moments from the team's 2014 campaign, which serves as the zenith of the Urban Meyer era. On a frigid, snowy and windy day in Minneapolis (otherwise known as Saturday), Ohio State beat Minnesota, 31-24, in what was officially the coldest game in the relatively embryonic life of TCF Bank Stadium, which doubles as home to the NFL's Minnesota Vikings. As if to flip the bird at the bitter conditions (and trust they were terrible), the offensive line refused to wear sleeves as did cornerbacks coach and noted coffee-guzzler Kerry Coombs. While the game itself was marred by the weather and thus not necessarily thrilling, the wintry conditions made for a slew of memorable moments. For the first time since suffer a season-ending shoulder injury, Braxton Miller addressed the public during Ohio State’s National Championship celebration last month, which drew 45,000 fans to Ohio Stadium. Trailing Indiana, one of the Big Ten's most feeble teams, in the third quarter, redshirt freshman H-back Jalin Marshall returned a punt 54 yards for a touchdown to turn the tide of the game. The play electrified an uneasy crowd at Ohio Stadium and was emblematic of Marshall's growing role in Ohio State's offense. 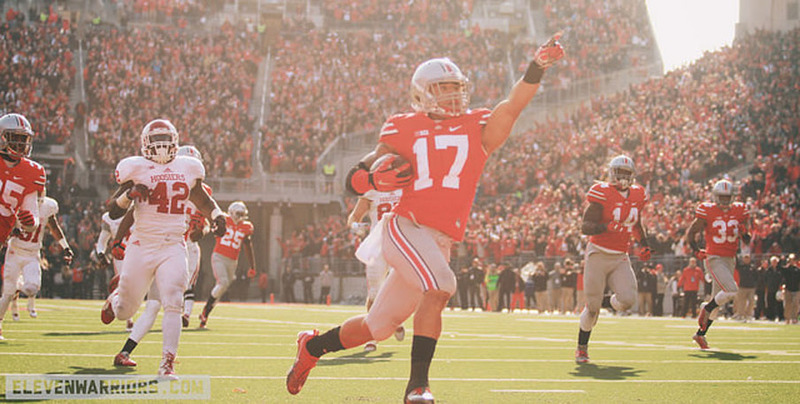 The Buckeyes won, 42-27. After breaking his ankle in the fourth quarter of Ohio State's regular-season finale against arch-rival Michigan, J.T. Barrett, on crutches and in pain, hobbled into the stands to watch the rest of the game. “I think a lot of people think it would be crazy pain, but I actually thought it was just dislocated on the field like the doctors twisted it because it was messed up, now. It was all over there," Barrett said the following week. "But they twisted it and yanked on it and I thought it was dislocated. I thought I was gonna be all right, when we got up there, did the X-rays, found out it was broken but I wasn’t in tremendous, horrible pain. Barrett, who rose from relative obscurity to stardom in Braxton Miller's absence, combined for a school-record 45 touchdowns. He finished fifth in the Heisman Trophy voting, an award that ultimately went to Oregon quarterback Marcus Mariota. In what was a breakthrough game for Ohio State at the time, the Buckeyes toppled Michigan State, the defending Big Ten Champions, in East Lansing. In the process, J.T. Barrett threw for 300 yards and three touchdowns and ran for 108 yards and two touchdowns against one of the nation's finest defenses. On the following Monday, head coach Urban Meyer suggested Barrett, who was previously Braxton Miller's backup, had done enough to warrant an open competition to be the starting quarterback next season. To seal a double-overtime thriller against Penn State, Joey Bosa, the sophomore and unanimous All-American defensive end, crushed quarterback Christian Hackenberg to the ground on fourth down. In front of an absolutely bonkers crowd, the Buckeyes escaped Happy Valley, which has been a house of horrors in years before, with their Big Ten title and playoff hopes alive and well. In New Orleans, after a month of buildup, Ohio State toppled No. 1 Alabama (winners of three of the last five national championships) in the Sugar Bowl to earn a trip to the national championship in Dallas. "It was a breakthrough win against an excellent team," Meyer said. In the process, Meyer bested Nick Saban, his old nemesis, and took a step toward regaining a lost throne as college football's alpha coach. After falling behind, 21-6, in the second quarter, the Buckeyes scored 28 unanswered points before putting the game away thanks to Ezekiel Elliott's 85-yard dash to the endzone late in the fourth quarter. On the eve of the Big Ten Championship Game, Ohio State found itself amidst a great tragedy that duly put football back in its proper place after Kosta Karageorge, a walk-on senior defensive lineman, found dead in a trash bin near his off-campus apartment. His death was ruled a suicide. On a somber and rainy Monday, as the Buckeyes geared up for a duel with Wisconsin at Lucas Oil Stadium in Indianapolis, Meyer was soft-spoken and reflective while speaking of his fallen player. "This is life lessons. This is so much deeper than lining up on a football field." "We’re trained to handle adverse situations, obviously not something of this magnitude. We’re trained to play football and this is so much more than that," said Taylor Decker, a junior tackle and Karageorge's friend. Compounded with a season-ending injury to starting quarterback J.T. Barrett days earlier against Michigan, Meyer said, "every red flag is up, every excuse is out there to not play well, to not win a game, to lose a game. You have some really good built-in excuses." Even so, Ohio State crushed Wisconsin, 59-0, to win its first Big Ten title under Meyer and earn the fourth and final spot in the first-ever College Football Playoff. The Buckeyes, which out-gained the Badgers, 558-258, dedicated the game to Karargeorge and wore stickers that simply read, "53" on their helmets. Perhaps most poignant was the tribute offered by Michael Bennett, the senior defensive lineman and captain, wore Karageorge's jersey. This one speaks for itself. In the biggest game of the Urban Meyer era, Ohio State overpowered Oregon, 42-20, to win its first national title in more than a decade. "I'm not shy about the love I have for this great state," Meyer said. "I've got to travel all around the country and I realized how fortunate I am to grow up in a great town like that in a great state ... to bring now a national title to the great state of Ohio, it's almost surreal." The win was the capstone of a season that started in peril and ended in triumph.